Horticulturalists, botanists and gardeners propagate certain plant species through budding, or methods of grafting in which vegetative buds of one plant are attached to another plant, known as rootstock. Budding, also known as bud grafting, is often employed in nurseries and greenhouses, though amateurs can do it themselves with a bit of practice. Budding can be used to combine cultivars from compatible species or create a clone of a single species. Major budding techniques include T budding, in which a “t” shape is cut into the rootstock and the bud from another plant is inserted into the cut. T budding requires bark to be slippery enough to create a t-shaped flap, into which a smaller stick containing vegetative buds can be affixed with rubber bands or cloth then covered in plastic. In chip budding, a flat chip of bud is tied over a sliced portion of rootstock. It is preferable for thick or nonslippery bark. Patch budding requires a piece of bark on a rootstock plant to be replaced by a bud-containing piece of bark from another plant. A rectangular slice of bark is cut from the rootstock and a similar-sized and shaped piece of bark from another plant is removed. The open pieces are put together and wrapped securely with plastic nursery tape. Deciduous shade trees are often used as budding plants to propagate nursery stock. Shade trees for budding share common characteristics, including good growth habit, disease resistance, ease of propagation and vigor, according to University of Illinois. Some of the trees used in budding include the ash, birch, black gum, buckeye, dogwood, elm, gingko, hawthorn, golden chain tree, linden, locust, magnolia, maple, mountain ash, oak, redbud and sweetgum. Most shade trees propagate best using T budding. Fruit trees are often used for budding, usually using the chip or T budding method. The best time to bud fruit trees is during the summer, when their buds are well developed and bark is slippery. Buds are mature enough for bud grafting when they have a brown hue. Fruit trees are usually budded to propagate stock, though the technique can also be used to graft top branches. Common varieties include stone fruits, such as apricots, cherries, peaches and plums. Other commonly budded fruit trees include apples and crabapples, avocado, hackberry, kiwi, mango, mulberry, pawpaw, pear, persimmons and quince. Some nut trees propagate well when budded. Many of these trees have thin bark that responds well to chip budding, though species with especially thick bark, such as the walnut, often respond better to T budding. This can be done starting in April and then continuously through the growing season, or as long as mature buds are available. 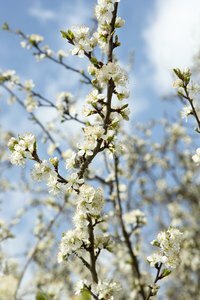 Nut trees for budding include the almond, chestnut, hazelnut, macadamia, pecan, pistachio and walnut. A few shrub types can be propagated through budding techniques. Shrubs are primarily budded using the chip method. Shrub chip budding requires a compatible plant to use as rootstock, preferably from the same genus and species, with at least a 1/2-inch-thick stem. Buddable shrubs include evergreen species such as cotoneasters, hollies and rhododendrons. Deciduous budding shrubs include azaleas, buckeye, flowering almond, maples, roses and serviceberries. University of Illinois at Urbana-Champaign; Budding, David J. Williams, et al.